Tradewinds - Third floor views of the bay and the pool! Spacious one bedroom condo. Welcome to Tradewinds at Laguna Reef at Rockport! This completely remodeled 1 bedroom 1 bathroom condo is located on the 3rd floor of Laguna Reef at Rockport. Enjoy the private balcony with an unobstructed view of Aransas Bay and the Rockport coastline. Also take in the abundance of bird life along the shoreline and relax in the cool coastal breeze. There is patio furniture available to you as a guest to use during your stay. And make sure to keep those curtains open on large picture windows and patio doors. You will definitely enjoy that view from comfortable living room and watching the large flat screen television with Spectrum Cable. There is a sofa that also a queen size sleeper sofa to accommodate two people. The dining table will seat two guests. Tradewinds has a full kitchen with all new stainless steel appliances, an icemaker, microwave and dishwasher and coffee maker. It is also fully stocked with all the cookware you should need. The kitchen has a bar that opens it up to the rest of this beautiful condo so you won't miss out on anything while you are cooking up your daily catch. The master bedroom has a brand new queen size bed and also has a flat screen television as well. There is also internet and wifi available at Tradewinds. As a guest of Tradewinds you will have access to the swimming pool, hot tub, 1000 ft. fishing pier with fishing lights, several shared charcoal grills, and the beautiful lagoon area at the water. There are also 3 large ice machines located on the first, second and third floors. There are also coin operated washers and dryers on the second and fourth floors in the same room as the ice machines. Tradewinds is located near the Rockport Heritage District and Rockport Beach. 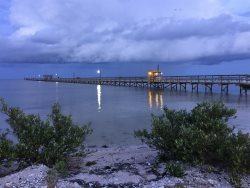 Spend a day in the sun at the Rockport Beach where you can rent jet skis, swim with the kids, or grill up some food at one of the picnic areas. The Rockport Beach also allows fishing and is only five dollars for a day pass or 20 dollars for a year pass. There are two piers at the Rockport Beach, the south pier is free and the north pier has a beach admission fee. There is also a boat ramp. We have a list of fishing guides on our site as well. Downtown Rockport is filled with shops and restaurants if you feel like a night out and some fresh seafood on the water. Check out a list of restaurants in Rockport on our site under activities and attractions. If you feel like shopping than you can grab a cup of coffee at the Daily Grind and walk along Austin Street and visit the shell shops and cute clothing boutiques. Plan your trip to Tradewinds today!